Body: Burgundy coat colour with rugged hair and occasionally scars. He is well built and strong despite his old age. He walks with a limp on his back left leg. Personality: Smith Wesson is the type of pony to accept the simple things in life. Growing up in the rural south of Equestria meant that the land was a harsh, cruel mistress that offered little for ponies to survive on. Unless you are a pony like Smith Wesson, who knows the lay of the land and how to make the most out of what little you have. Wesson likes nothing more than to spend a night out camping in the wild. As he spends half of his time living in the wilderness, he is very comfortable living on his own. However, he can be rather sociable if he is in the mood and will make an effort to be friendly and hospitable to whoever he meets. He prefers quiet and smaller settings than that of major cities or towns. Over his long life, Smith Wesson has become a more hardened to the harsh realities of life than his more youthful self. Where twenty years ago, he would have been seen as ambitious, courageous and adventurous, Wesson is now a subdued and experienced veteran of his lifestyle. To the locals, he is seen as a pony to rely on in times of need. While Wesson denies any claims of being a “hero” or anything of the sort, he will always strive to do what is right. He will admit that while he has never done outright wrong, he has committed morally questionable acts that he must believe are justifiable means to an end. As someone with a clouded past of his own, his virtuous deeds can be seen as stemming from both honour and guilt. Likes: Wildlife & wilderness, camping, Appleloosa, country & western music, shooting, farming, whiskey (and lots of it). Dislikes: Built up towns/cities, crowded areas, griffons, injustice and wrongdoing. History: Wesson’s father, Lock Stock, worked on a ranch in south Equestria. He was well adapted to working with cattle, crops and generally farm life. During an outbreak of illness one winter, the ranch brought in a medical professional, a mare from Manehatten called Cherry Heart. They soon fell in love and married to have their only child, Smith Wesson. Like his father, Smith Wesson grew up fond of the great outdoors. In contrast to the city, he loved the open countryside and the harsh, natural landscape of the south. Growing up on a farm and with skilled parents in survival and medicine, Wesson learnt many important skills and lessons as a young colt, becoming a tough, self-reliant pony. His father, being a skilled bushpony, taught Wesson all about survival in the wilderness, spending many nights camping out together under the stars. When a group of griffon bandits attempted to rob them one evening, his father used something Wesson had never seen before; a revolver. 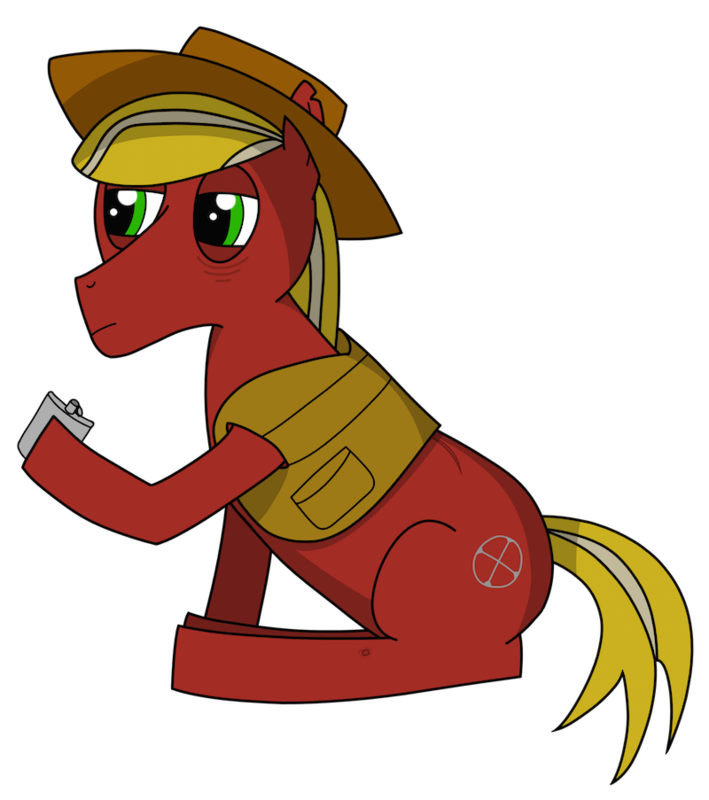 Wesson became obsessed by the weapon and when he finally convinced his father to let him try it, he earned his cutie mark. Several years later, his parents decided to retire from farming, leaving the raunch to move to Trottingham. His father presented him with his revolver as a parting gift. Wesson has visited them several times every year ever since. He carries the six shooter in a concealed holster inside his waistcoat, along with spare ammunition. He spent his youth trekking across the southern regions of Equestria, working at ranches and settler communities. He was a wild and free spirit, who aimed to find adventure whenever he could. Saving ranches from bandits and local shooting competitions was how he first became known for his skills with a revolver. Over a short time, Wesson found himself amongst a group of like minded ponies. These are the golden years of Wesson’s memories as he looks back on them as the four of the group were inseparable; Snake Eyes, Wild Ace, Saddle Sore and Smith Wesson. Their aim was to adventure the south and seek their fortune together, while often helping those in need of aid. It wasn’t until many years had passed did Wesson finally notice the changes in his former friends. Each had turned either become twisted, manic or depressed, and he himself had become more cynical. The actions of the group walked the line of an outlaw gang, and arguably had stepped over the line several times. After confronting the group with the truth, it wasn’t long until the four ponies disbanded. Smith Wesson continued with the same lifestyle of venturing the south on his own. Despite his previous and continued involvement in the grey area of the law, Wesson was considered by most to be an unofficial lawpony. He sort to help those in need, a vendetta fuelled by his insistence to strive for good and by guilt for his past. Now in his later years, Wesson finally decided to settle in Appleloosa, where he sometimes works on the local farmland. He spends half of his time in town and the other half simply living in the wild. The very question struck Smith Wesson as rather stupid as he surveyed the situation. The colt was only little yet he had demonstrated something of a terrible attitude towards the scared filly in front of him. Wesson almost felt it was his duty to step to set this kid in his place. "Son, I'm lookin' at you," he stated calmly, looking down at colt. His voice lowered as he leant down to meet the colt at his height. "'Cause you can't just keep bullying this here filly, or else you and me are gonna have something of a problem." By now, Wesson's face was mere inches from the nervous colt. "Got it?" The bully's eyes looked between the giant, hulking earth pony and his victim. He gave a hasty nod before turning around and trotting away hurriedly. Watching him go, Smith Wesson went to speak to the filly but noticed that she too had taken off. Use of a gun is indeed very concerning with an unsure level of canon and pony societies use of them. Next time your on chat, i would like to discuss it with you. While guns exist, we have established that they are illegal to have in many ways, but that does not prevent them from getting into pony hooves. Send me a PM if you are in chat sometime and i timed out or something. Edited, hopefully in compliance with the rules. Meeting occurred in chat. Approved!